Ever since we got the Caffitaly System S14 from Woolies, it has seem like we don't ever drink anything else around the house, Bestie and I. We got the machine for AU$49 (a bargain!) when CBTL sells them for RM 980 for their Kaldi machine (a VERY similar design!) on their website. 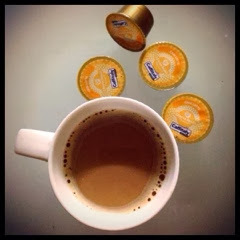 Now, being a (self-proclaimed) coffee connoisseur I surprised myself when I find that I am mostly obsessed with the Gloria Jean's Chai Latte capsules! I have never been a tea drinker, never even tasted a decaffeinated coffee.. I have always been a through and through, full blown coffee lover! So yeah.. Chai latte! I am totally into it! But only the one from Gloria Jean's it seems. Tried the one from CBTL and it's nowhere on the same par. The CBTL capsule tasted a tad sour, like it has a bit of tamarind in its ingredients. Don't know if it actually does, but it sure do taste like it did! So in India, they're called "chai Masala".. But I've had one in Hyderabad once and I didn't like it at all! It was really heaty and heavily tasted of ginger.. Ughh! Aaanyway, I first bought my first pack of ten on a whim during my stay in Perth. Saw the capsules and said, why not? Didn't expect that I would love it so much! So much that everytime I've been out the whole day, I would say to myself that I can't wait to get home and have a cup of chai latte! I'm wondering how the teabag version of chai by the other brands tastes like. I know Coffee Bean and Lipton makes them but dare I spend on them only to be disappointed? hmm.. We shall see. Perhaps I'll try them out once I ran out of my capsules stash. Do u mind sharing where did u get that cheap coffee machine? Bestie and I got it from a supermarket in Perth called Woolworths. It has a different plug from our local socket points but similar voltage, so it's fine to use here..